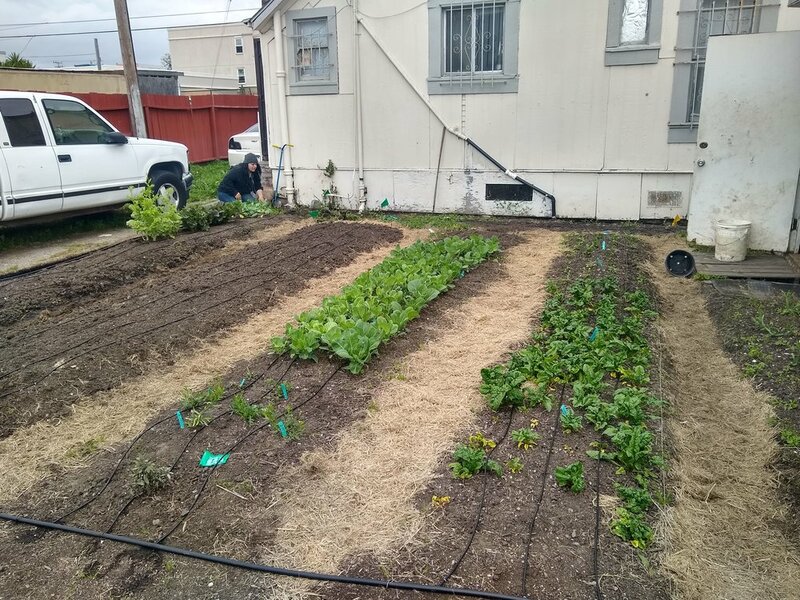 On a sunny Monday afternoon, the Community Justice Garden Program at Planting Justice was busy installing an automatic irrigation system for a beautiful, all volunteer run farm at the Bay Area Rescue Mission. The Bay Area Rescue Mission is a shelter and food pantry in Richmond that serves over 300 meals a day to houseless folks, as well as offers culinary skills training in their commercial kitchen. Their farm grows bountiful fresh, organic food served in the daily meals! The farm is all volunteer run, and without automatic irrigation Bay Area Rescue Mission would not have had the volunteer capacity to keep the farm running this summer. However, thanks to irrigation expert and Planting Justice leader Salvador Mateo, and with the help of the Community Justice Garden Committee at Planting Justice, we were able to install an efficient, easy to use irrigation system to keep the farm thriving! Learn more about the Community Justice Garden Program here and to nominate a community site for a free garden installation! And check out these photos of the irrigation installation!